Ten years ago a pair of archaeologists dug up a remarkable dinosaur fossil in the Liaoning Province of northeastern China. It appeared to be very similar to other small raptors that had been found around the world. It had a feathered body, adding to the prominent theory that many raptors had feathers. The remarkable aspect of this dinosaur was that it seemed to have flight feathers on its hind legs as well as its upper limbs. 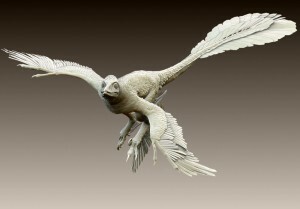 This led Chinese paleontologist Xu Xing to hail it as a “four winged dinosaur” and he soon named it Microraptor gui. long, giving the obvious impression that they were used for flight. The aspect of the feathers that definitively showed that they were flight feathers was not their length but the fact that they seemed to be asymmetrical. The central shafts of the feathers were offset towards the leading edge. This geometry is found in the flight feathers of all modern birds and is what gives each feather it’s characteristic cambered airfoil shape. This hard evidence of developed flight feathers, combined with the Microraptor’s lack of the specialized shoulder joint needed for flapping flight, seemed to sugest that it was a glider. The new question was how good of a glider, and what role did the back wings play? Several different groups have attempted to answer this question. One of the initial theories was that the Microraptor used its hind wings as a way of controlling the speed and efficiency of its decent. It would initially keep its hind limbs extended out behind it, with the feathers making a kind of canopy over the tail. This position, when tested in a wind tunnel, seemed to create the most lift, but also created the least drag. This meant that the Microraptor would have had little control over its own speed in this position, which would make it extremely difficult to land. In order to slow down, and reduce the chance of a possibly catastrophic crash, it may have gradually brought its legs under itself and splayed the feathers on its legs out sideways, creating a second wing. This position, often referred to as reminiscent of a biplane, seems to have been the most stable, although not producing enough lift to create a very efficient glide. Additionally the Microraptor would be able to move its legs forward, causing it to pitch upward. This is possibly the way it landed, with a last minute adjustment so its head would move up and back and it could grab ahold of a tree or branch with it’s feet and hands. Another theory was published that stated that the biplane configuration did indeed create enough lift for a successful glide. This theory states that the Microraptor most likely glided exclusively in the biplane position. 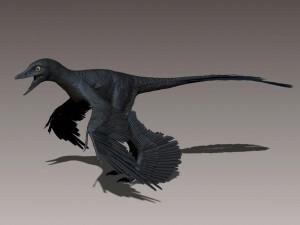 A third theory, presented by a group at the University of Southern California, states that the two main wings produced enough lift on their own to adequately keep the Microraptor aloft. During normal gliding the rear limbs would be tucked up under the body. The second set of wings would primarily be used for maneuvering in the tight confines of prehistoric forests. The group claims that the use of the rear wings as control surfaces would allow the Microraptor to turn and maneuver up to twice as fast as a similar animal with only one set of wings. Regardless of how it actually glided, the question remains whether the Microraptor represents an intermediary stage between small arboreal dinosaurs and modern day birds. Many people cite its existence as evidence for the top down theory of the evolution of flight. They cite presence of long flight feathers that are very similar to those of modern birds to identify Microraptor as an ancestor of modern fliers. While the evidence is good, it is by no means definitive. It is completely posable that some day soon a small running raptor fossil will be discovered with flight feathers. Also the Microraptor may just be a dead end on the evolutionary tree, after all there is no modern bird species with flight feathers on two sets of limbs. Realistically we may never know how flight truly evolved, and for now it still remains unclear whether flapping flight evolved from gliding or running. Nice post Sam! Just a quick plug that the two 3D Microraptor models are by David Krentz (Justin Hall and I commissioned those pieces from him for our paper). Some of the media outlets have left off the attribution (a good lesson for doing media releases: always double check to make sure your artists get proper credit). One item to consider: the canopy model managed reasonable L:D ratios, but it also “reverses” the hindwing feathers so that the rachis of the feather would about about 1/4 chord from the *trailing* edge, rather than the leading edge. Based on your coursework, I suspect you can work out why this would be a potential problem. Cheers! I find it interesting that there are three possibilities for the way this creature could fly. If the microraptor could truly use its hind leg feathers to create and arch with its tail, then it would be one of the first gliding animals. The more plausible theory to me was the microraptor’s ability to use its leg feathers as a secondary wing and control its flight. The arch theory wouldnt allow the raptor to have much control over its movement.